What's the colour of your country? What is the colour of your country? I have recently moved to Melbourne, Australia. Another country, another continent. Didn’t I report that exact same thing in 2014? I did indeed! Not a new hair cut this time, but the clear-cut realisation that I am finally fulfilling the dream of living in this part of the world. As luck would have it, I have actually “been here, done this” a fair number of times in my life. Twice I moved across the Atlantic (to Argentina in 2009, and to the USA in 2014), so why not across the world this time around? It might seem to you like I never stop wandering the world. I can see why it would, as it does even to me sometimes… but I do! Stop, I mean. Long enough to learn a thing or two about ‘my new country’, and usually a whole bunch of things about myself and my own culture and habits. Traveling is very much an enriching, horizon expanding, learning experience. One that teaches you patience, reflection, and perspective. Once you trek, there’s no way back. Those of you who have ever attempted living in a country and culture different from their own, know that it means starting from scratch. In all aspects of life. Wear a smile, bring a load of positive energy, and get cracking. In the first few days to weeks you look for accommodation. No need to elaborate. Everyone appreciates having a roof over their heads. Shelter and sustenance are quite closely followed by social shenanigans. Or intertwined, rather. Human beings are social animals. Anyone who tries to state or prove otherwise, is going against nature, society, or their parents, and quite likely suffering from some sort of psychological scarring. The truth is, we ALL need friends. I love admiring, babbling, chatting, dancing, experiencing, feeling, going out, hugging, investigating, joking, kissing, learning, migrating, nourishing, observing, playing, quizzing, rejoicing, sharing, translating, understanding, venturing, welcoming, yearning, and zigzagging. I love an entire alphabet of things you can do in good company! Because I love having fun. And yes… that involves people. Where was I? Oh yes, socialising in Australia. Step three of the immigration process. And what better place to start than through an Internations event. Local or expat, let’s have a chat. And lo and behold, less than a week later I am having coffee on the Yarra river with three girls from Germany, Malaysia, and Hong Kong, respectively, and of course my boyfriend from the United States. We all laughed about our own little Internations that we had created: 5 different nationalities having a coffee together! At some point in the conversation, I told my new friends that I have traveled quite a bit over the years. I made an attempt to count the countries, but had to settle for a rough estimate. Later that night at home, I came up with the astonishing final number. 45 countries, 45 cultures, 45 histories, and 45 peoples. Now that would be some colourful bunch if you were to put one person of each of those nationalities together! Hm… Countries described as a colour? Interesting, you might think. My thoughts exactly when I read the post “Blue New Zealand” by the Young Adventuress. Now I don’t presume to assign a different and unique colour to each country I have visited, nor will I be able to do so purely on its natural beauty. In fact, I don’t think it is fair or fun to even be doing this on my own… I’ll need your help! If you’d like to contribute to this list, please tell me about the colour of your country! I’ll be adding your entries over time, so check back every once in a while. And remember: the colours you associate with your country, do not necessarily have anything to do with its national or flag colours! In other words, this Country Colour List can be based upon Culture, (personal) Experiences, History, Landscapes, Sports, Traditions, or whatever else you think distinguishes your country from the other approximately 195 independent nations on Planet Earth today. Is your country not yet on this list? Feel free to share your thoughts! I would love to hear learn about your country, culture, and experiences. Not only would that be a wonderful addition to and extension of this article, but the Lord knows I love to travel… Who knows, you might convince me! PS: The list of countries is in (approximate) chronological order of me visiting and/or living there. Additional entries will simply be added to the list in order of reception. PPS: Please indicate if you do not want your name to be published. I will make sure to post it anonymously. As much doubt as there may be about the name of my country – Is it called the Netherlands or Holland? Are they even the same thing? – there is no question about our national colour. Nothing to do with our flag colours (red, white, and blue), but a direct result of the last name of the first ruler of the earliest Dutch independent state, the Republic of the Seven United Netherlands founded in 1581. The House of Orange-Nassau, founded by William I of Orange, still rules the Kingdom of the Netherlands today! The Dutch people proudly show off ‘our colour’ during certain national holidays, summer festivals, or huge sport events like the Olympics or the World Cup Soccer. Any opportunity is welcome for a little display of patriotism. Or is it more about the dress-up? Personally, I wouldn’t necessarily describe my people as the most nationalistic or proud – we are extremely good at complaining about the weather, our economy, and politics – but the fact is, you’ll see Orange everywhere and in abundance. We’ve even been called the most loyal and fervent crowd of supporters more than once! - by Gabriela Gonzalez, Buenos Aires, Argentina. To me Argentina is the light blue of Jacaranda Trees that provide a beautiful setting in the City when in bloom, the green in the country side and suburban areas, the red ground of the Mesopotamia, and the different shades of brown in the Mountains. There are as many colors as there are different people, all blending together to create the most beautiful of rainbows. - Raúl Christian Aguirre, Argentina. (Living in: Barcelona, Spain). –> I adhere to the violet blue of the jacarandas that Gabriela proposes for the city that I have left, but won’t leave me. - by Will Black, North Carolina, USA. If I envision my country as a color, it would appear in shades of deep blue. As Americans, we often pay respect to the trinity of colors that comprise “Old Glory,” but from the outset it has been Blue that most prevalently represented the nation. Our revolutionary Continental Army opted for blue uniforms, standing in stark contrast to the red coated British enemy. The American military carried on with the blue tradition, continuing through the Civil War. Various federal flags, including those of the President - whose official color as Chief is blue – and Congress, feature the same dark blue fields. The Great Seal of the United States uses blue to signify “vigilance, perseverance, and justice.” During the 20th century, as left-wing communist movements increasingly associated with the color red, the U.S. used blue in opposition. In our Olympic feud with the red clad Soviet Union, the U.S. again wore blue in competition. To this day, blue remains the color of corporate America, featuring prominently in the logos of IBM, Dell, General Electric, Ford, GM, Walmart, Facebook, Twitter, so on and so forth. Beyond the historical uses, blue is the color of freedom, confidence, power, imagination, and inspiration, many of the values we Americans hold dear, and what makes the American Dream an enduring concept to this day. Being the color of sky and sea, blue has also come to stand for open spaces and expansiveness. If I think back to home, I immediately conjure up images of the Blue Ridge Mountains, offering wide vistas shrouded in distinctive blue haze. More personally, I would also think of my favorite American sports teams, who hit the field in blue. I think of my alma mater, with its own Carolina Blue, and our nemesis down the road dressed in Duke Blue. Blue is a vastly interpretable color, applicable to many peoples and nations. Likewise, a fellow American from across the continent or right next door might define the country by a very different hue. To me, however, this is undoubtedly the land of blue! Not a country, but definitely worth mentioning on this colour list. In fact, this colourful little island in the Carribbean might be best described by the word “Rainbow”. 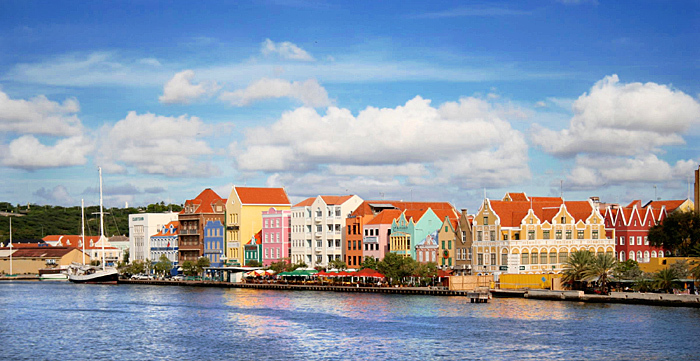 Not only is Willemstad decorated with the cutest little houses in all sorts of lively colours, as if it were the exotic little brother of Amsterdam, but the Dutch Antilles are also blessed with an incredibly colourful and friendly population. * Photo credit: Featured image adjusted from an illustration used by Cobb+Co Museum, Toowoomba, Queensland.